A limited edition of only 1,000! The Road to the National Championship is encompassed in this collectible frame featuring commemorative tickets, three gold plated minted commemorative coins and custom engraved nameplates! This limited edition frame measures 22”x 18'' with 2.5'' wide custom molding and a plexi glass front panel. 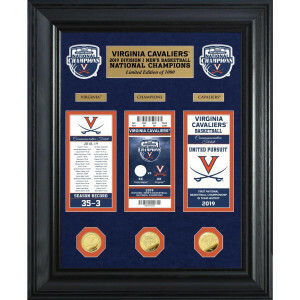 Featured in double matting with the top mat in suede is a commemorative ticket listing the Champions 2018-19 regular season games and scores, a commemorative championship game ticket and a commemorative team ticket. What makes this a true collectible are the three (3) 39mm minted coins, each carefully flash plated with 24KT gold. An engraved nameplate matted at the top of the frame lists the Limited Edition! The minted coins are; the 2019 Basketball National Champions commemorative coin and 2 commemorative University coins. Limited edition of only 1,000 and officially licensed. An individually numbered certificate of authenticity accompanies each collectible frame. Proudly made in the U.S.A. by The Highland Mint!